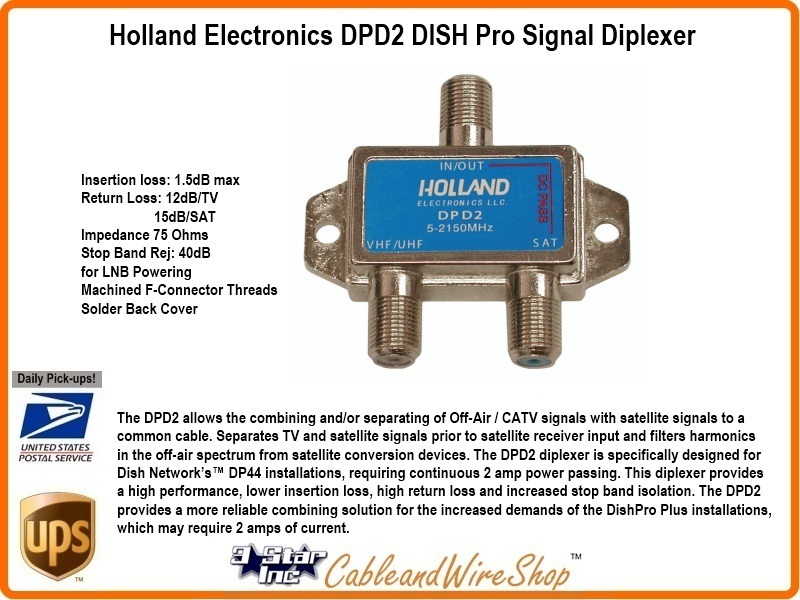 The DPD2 allows the combining and/or separating of Off-Air / CATV signals with satellite signals to a common cable. Separates TV and satellite signals prior to satellite receiver input and filters harmonics in the off-air spectrum from satellite conversion devices. The DPD2 diplexer is specifically designed for Dish Network's DP44 installations, requiring continuous 2 amp power passing. This diplexer provides a high performance, lower insertion loss, high return loss and increased stop band isolation. The DPD2 provides a more reliable combining solution for the increased demands of the DishPro Plus installations, which may require 2 amps of current. Note: I think this is one of the best Diplexers made. It goes up to 2150 MHz for DISH Network Satellite Signal Carriage and passes from 5 up to 806 MHz for Antenna and Cable TV. The casing is very Solid and Hardy and Carries the Regal Brand Name. Remember that depending on the Example Scenario you are following for DISH Network, DirecTV or other Satellite DBS provider, you may need more than one, or several of these components to complete the installation. The DISH Network approved products list is issued by them and changes without notice. Approved Accessories are required from the Dish Antenna to the Receiver and all components used in mounting and grounding. Items developed and distributed directly from Echostar Satellite LLC are to be considered as acceptable by default. DISH Network develops this list to assure quality and longevity to your DISH Network experience. Tested by their Labs and Approved by their Engineering Team, these parts represent high quality components that are utilized in other Installations as well. Not all parts used in DISH Network Installations are "Controlled Items" and "Custom" installations may require special materials not found on the list. A Prime example of this is RG11 cable, which is absolutely necessary for long distances between the Dish and the Receiver, but is not addressed at all by the "Approved" list. "Reasonable is as Reasonable does", if you find yourself in a particular "tight spot", ask a DISH Network Installer for advice, and then buy the materilas needed from one of the same places they do! These are the Products that appear directly on the DISH Network approved list. We have many more Products that Installers use that are not covered by any list. Feel free to browse for those items by Category directly! DISH Network in no way endorses this website or the Products carried by same that appear on their list.